Fossil red algae, like many of those today, were important in the formation of reef communities as early as the Silurian. The Graticulaceae (see above) were important structural components of Silurian (Nose et al., 2006) and Devonian (Adachi et al., 2007) reefs. Another reef-building red alga from the Devonian is Archaeoamphiroa, which occurs along a 48-km outcrop within the Alexandra Reef Complex (Frasnian) in the Northwest Territories, Canada (Magathan, 1985). This fossil closely resembles the extant coralline red alga Amphiroa (Corallinales) and consists of alternating long and short rows of cells. The lithofacies suggest that this alga grew in a shallow, surf-swept reef in association with other filamentous algae. Masloviporidium is a cosmopolitan calcareous red alga from the Carboniferous, ranging from Russia to central Texas (Groves and Mamet, 1985). The thallus is sheetlike and consists of rows of wedge-shaped cells surrounded by calcified partitions. Each cell is connected to cells above and below by pores in the partitions. Nothing is known about the mode of growth or reproduction. Another Carboniferous (Pennsylvanian) red alga from marine rocks is Litostroma (Mamay, 1959a). This small alga is formed of irregularly shaped, thalloid platelets that are one cell thick and up to 6 mm in diameter. Filaments arise from the surface of the thallus, and irregularly shaped perforations are present along the margin. Many of the cells contain shrunken cell contents or nuclei. In addition to being assigned to the red algae, Litostroma has also been suggested as a member of either the green or brown algae. One of the geologically most important orders of marine calcified red algae is the Corallinales. The crown group Corallinales includes two living families, the Corallinaceae and the Sporolithaceae, both of which have been documented from the Mesozoic and Cenozoic (Aguirre et al., 2000). Both families are characterized by macroscopic crustose or erect and branched thalli differentiated into two distinct histologic zones. The hypothallus, or medulla, which forms the basal part of the crustose plants and central part of the erect forms, is constructed of loosely arranged, relatively large cells. The perithallus (cortex), or second zone, which constitutes the major portion of the thallus, is located above the hypothallus in crustose forms and outside of the hypothallus in branched forms. It is characterized by smaller cells (Lee, 1999). In addition, a distinct surface layer, the epithallus, may be present and this is composed of one to a few layers of small, thin-walled cells (Xiao et al., 2004). Sporolithaceae and Corallinaceae are indistinguishable in vegetative anatomy but differ in sporangial structure: the former family is characterized by sporangial chambers grouped in sori, whereas the latter produces sporangial conceptacles with one (uni-porate; Lithophylloideae and Mastophoroideae) or several (multiporate; Melobesioideae) small pores for the dispersal of spores (Aguirre et al., 2000). FIGURE 4.51 J. Harlan Johnson. 1962) (FIG. 4.51). Earlier (Late Jurassic) records of the genus remain questionable with regard to both age attribution and taxonomic circumscription (Aguirre et al., 2000). Taxa demonstrate a variety of growth forms, ranging from tiny crusts to large aggregations <30 cm in diameter. Based on a study of Miocene non-geniculate coralline red algae from Crete (Greece), Kroeger (2007) suggested that various species of Lithothamnion , along with other forms, such as Sporolithon, can be used as valuable proxy indicators for paleoenvironmen-tal studies in Cenozoic sediments, because these algae appear to form specific and consistent associations depending on water depth and water temperature. Early Cretaceous coralline algae from India have also been used as a proxy indicators for water depth and water temperature (Misra et al., 2006). Another widely cited genus is Archaeolithothamnion (Johnson, 1963), which has been regarded as a junior synonym of Sporolithon (Moussavian and Kuss, 1990; Tomás et al., 2007). One Early Cretaceous (Barremian-Albian) species originally assigned to Archaeolithothamnion is Parakymalithon phylloideum (Moussavian, 1987). 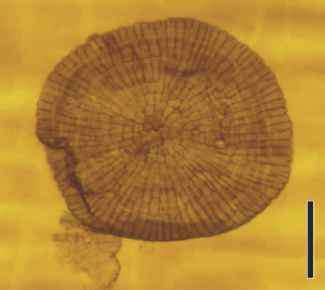 The thal-lus of this alga is composed of a relatively thick hypoth-allus and only a few distinct horizontal rows of cells in the perithallus. Asexual reproduction occurs in the form of oval-shaped or fusiform sporangia arranged in a nemathecium-like receptacle that lies cushioned above the perithallial tissue. Parakymalithon is believed to be phylogenetically intermediate between the Sporolithaceae and Corallinaceae. Recently, however, the separate status of Parakymalithon as a genus has been questioned (Tomás et al., 2007). Karpathia (FIG. 4.52) is an example of a Cenozoic (Paleocene) form assigned to the Corallinaceae (Bassi et al., 2005). The hypothallus of this encrusting alga is composed of straight, loosely arranged filaments of irregularly shaped, large cells, which resulted from cell fusion. The perithallus is formed of densely arranged filaments or a series of smaller, thick-walled cells. Sporangial conceptacles are uniporate.